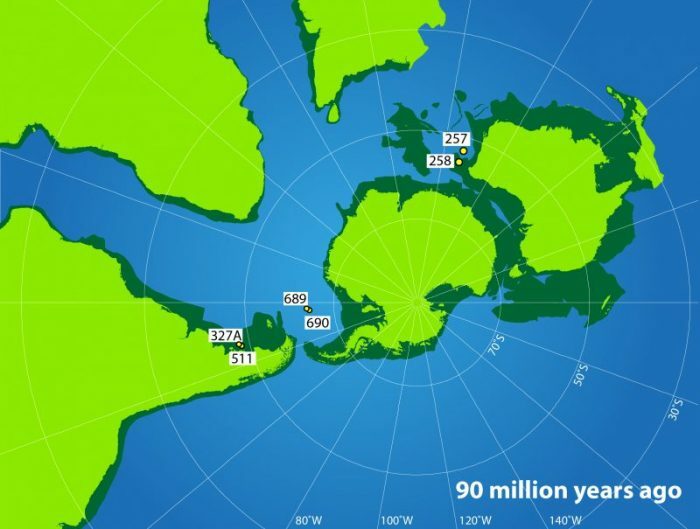 Evidence that the polar regions were much warmer during the Cretaceous Period (145-66 million years ago) compared to today has accumulated during the past century with numerous reports of fossil wood, dinosaurs, and other temperature sensitive organisms that lived in the Arctic and Antarctic regions. Discovery of champsosaur (a crocodile-like reptile) remains, found at ~72°N and dated as 94-86 million years old (Ma), proved that the winter temperatures they endured could not have fallen below freezing given their metabolic requirements for survival. But fossil occurrences alone cannot provide the quantitative estimates needed to reconstruct Earth’s temperatures from the tropics to the poles and how they changed through time. 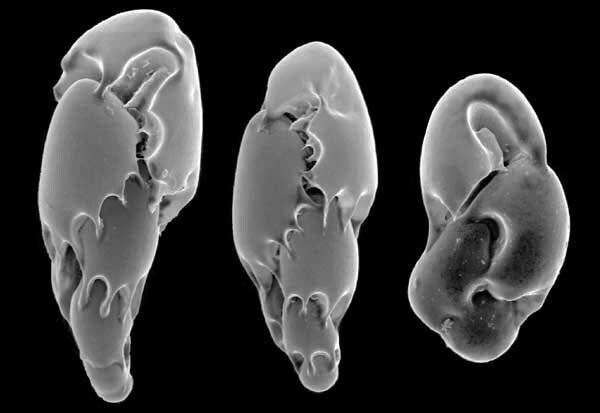 Fortunately, the shells of tiny single-celled organisms called foraminifera contain chemical information that enables determination of how ocean temperatures changed through time. Planktic (surface-dwelling) and benthic (bottom-dwelling) foraminifera often occur together in sediments deposited in all the world’s oceans and they have a fossil record that extends from the present day to ages much older than the Cretaceous Period. Within the shells, two isotopes of oxygen, oxygen-18 (18O) and oxygen-16 (16O), become fixed in a proportional ratio determined by the temperature of the surrounding ocean water at the time when the shell mineralizes. Measurements of the oxygen isotope ratios, referred to as δ18O, enable estimation of ocean surface and ocean bottom temperatures as long as the planktic and benthic shells have not been significantly altered from their original condition. A recent compilation of oxygen isotope measurements from benthic and planktic foraminifera that lived in the south subpolar region provides new insight into how the circum-Antarctic climate changed through the Cretaceous and Paleogene Periods. The compilation is based on analyses of foraminifera from sites located at >60°S latitude (Figure 1) and deposited at depths of at least 1000 m. Results from the southern South Atlantic (Sites 327, 511, 689, and 690) and southern Indian Ocean (Sites 257, 258) demonstrate that the earth was much warmer than today for the entire time from 112 to 35 Ma, but the period between 94 and 90 Ma was extremely warm (Figure 2). During the peak of the “Hot Greenhouse” climate, a time referred to as the Cretaceous Thermal Maximum (KTM), the average temperature of the ocean bottom estimated from deep-sea benthic foraminifera (from between 1000 and 1500 m water depth) ranged from 19–21°C. Today, water in that depth range at subantarctic latitudes range from 1–2°C. Near the ocean surface during the KTM, high latitude surface-dwelling planktonic foraminifera indicate tropical conditions at subpolar latitudes, with values ranging from to 26–32°C. The foraminiferal temperature data indicate that Hot Greenhouse temperatures prevailed until 81 Ma in the South Atlantic, whereas the onset of a long-term cooling trend began immediately after the KTM in the Indian Ocean. An explanation for these different trends requires further investigation. The long-term cooling trend of Cretaceous surface and bottom water temperatures and reduction in the vertical ocean temperature gradient culminated at 70–66 Ma with bottom waters ranging between 5–7°C and surface water between 7–10°C. One brief exception during this relatively cool interval occurred at 66.2 Ma when massive volcanic eruptions at the Deccan Traps in India released greenhouse gases and caused a brief warming known as the Deccan Warming Event. Southern high latitude ocean temperatures between 66-56 Ma were slightly warmer than during the latest Cretaceous and then abruptly increased at 55.5 Ma during an event called the Paleocene-Eocene Thermal Maximum (PETM). This warming event has been identified worldwide and is associated with a dramatic change in the carbon cycle due to an immense injection of carbon into the atmosphere, perhaps due to a brief phase of massive volcanic eruptions. Following the PETM, southern high latitude temperatures cooled gradually as Earth transitioned from a warm greenhouse to a coldhouse climate. One brief exception within this cooling interval is the Middle Eocene Climatic Optimum (MECO), which occurred between 42-41 Ma and has been attributed to a carbon dioxide release due to tectonic activity during the continental collision of the India and Asia continents. By 36 Ma, ocean surface and bottom water temperatures around Antarctica declined to near 0°C, enabling growth of a massive continental ice sheet that drained into the Southern Ocean. 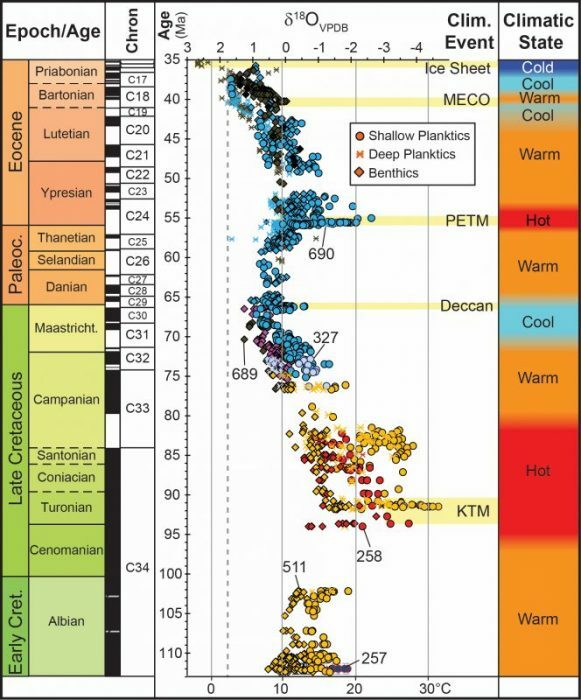 The temperature compilation for the southern high latitudes demonstrates that the greenhouse climate during the Cretaceous was much warmer and much longer lasting than any time afterward. Increased rates of seafloor spreading, which caused eruption of new ocean crust as oceanic plates diverged, and massive eruptions of enormous undersea islands of basalt called Large Igneous Provinces, are considered the main causes for extreme warmth during past hot and warm greenhouse climates because of the expulsion of tremendous volumes of greenhouse gases. The transition from hot to cool and then cold climatic states resulted from slower seafloor spreading rates and a reduction of greenhouse gas outputs. Additional factors that caused global temperature cooling especially at southern high latitudes include separation and northward movement of the southern continents that had comprised the Gondwana Supercontinent. This ultimately led to thermal isolation of Antarctica, global sea level lowering (causing higher reflectance and less retention of solar energy), and increased rates of weathering on land (causing the removal of carbon dioxide from the atmosphere). A better understanding of the factors responsible for global climatic changes during the geological past and the response of the ocean-atmosphere system to those changes is critical to establishing more accurate predictions of future global climate change. This will require identification of the main sources of carbon dioxide and other greenhouse gases responsible for triggering and sustaining past warming events, especially during the hot greenhouse climate phases. Efforts will need to focus on obtaining more reliable age calibrations of the onset and termination of Large Igneous Province eruption ages, improving age constraints for calculating changes in the rates of seafloor spreading and plate subduction, and improved modeling of how carbon has moved between the atmosphere, oceans, biosphere, and geosphere. In order to prepare for life on a Hot Greenhouse planet, scientists need to study the fossil record across dramatic shifts in global climate that have occurred in the past, such as those highlighted in Figure 2. Comparison of the life habits among species that were vulnerable to extinction with those of resilient species that survived and determination of environmental thresholds that caused ecosystems to collapse during the past will help predict how organisms and communities on land and in the ocean will respond to the warming and other environmental changes that await us in the future. These findings are described in the article entitled The rise and fall of the Cretaceous Hot Greenhouse climate, recently published in the journal Global and Planetary Change. This work was conducted by Brian T. Huber from the Smithsonian Institution, Kenneth G. MacLeod from the University of Missouri-Columbia, David K. Watkins from the University of Nebraska, and Millard F. Coffin from the University of Tasmania, University of Maine, and the Woods Hole Oceanographic Institution.